We get asked very often: are there any free things to do with kids in Zurich? Zurich might be one of the most expensive cities in the world, but it doesn’t have to be. 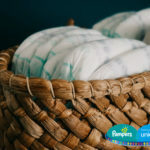 Especially if you have kids, you might want to do great activities with them, but the bill quickly adds up to quite a high sum taking into account the entry fees to a lot of attraction. But having a great day out with your little ones doesn’t have to be expensive. We’ve compiled a great list of free things to do with kids in Zurich – get inspired below. One of our favourites of free things to do with kids in Zurich is simply to rent a free bicycle with a children’s seat and discover Zurich by bike, this is a great way to get some fresh air, see a whole lot of the city and discover Zurich at your own pace. There are several places around the city where you can pick up free bikes. Check out Züri rollt: free bicycle Link. In and around Zurich, there are many amazing outdoor playgrounds for your kids to enjoy and for parents to relax. We suggest Josefwiese park and playground – this is a big one and very popular with locals. It has sports facilities and a designated barbecue area – perfect to unwind on a weekend, or even to make some new friends – everyone is very friendly here: Josefwiese Park Link. The Zurich Zoological Museum is free and interesting as well as educating for children. It was opened in 1833 and has a long history and interesting artefacts. Kids will learn about natural history, ancient species like dinosaurs and all kinds of interesting facts: Zoological Museum Zurich Link. There is another museum that you can visit for free with your kinds, Helmhaus Zürich is a contemporary art museum that has a very interesting program featuring young Swiss artists. It also has some family and kids free exhibition viewings and workshops: Helmhaus Zurich Link. Take your kids to one of the free open-air pools in and around Zurich. Our recommendation is the ‘Unterer Letten’ outdoor pool – it’s free and open every day from the morning til late evening. Note that the “Badi” might close early when the weather isn’t right. It`s a great place for families, friends and kids all ages! The place offers all you need for a great Badi experience, it`s easy to reach, it has a nice playground with sliding and slagging, two pools, little cafe, changing rooms and showers. For every kid this is an amazing day out and a great way to cool down in the summer. Unterer Letten Link. 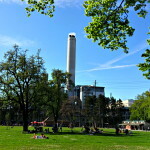 Every day at 3 pm there are free walking tours in trendy Zurich West. You don’t have to reserve your spot, just turn up on the day that you want to take the tour. The walk lasts about 90 minutes and goes across attractions like Josefwiese, Technopark and Prime Tower. Most tours are in English, so it would be beneficial if your kids understand this language. On some days, there are also tours in other languages – find details here: free walking tours Zurich Link. This tip is a super unique and fun way to discover the city with kids. You can do interactive audio walks with your children – how interesting is that. These tell creative stories and set your little one’s imagination free. The audio is in Swiss German, so a great way for expat kids to learn the language a little more and also have a great day out. free audio walks for kids Link. Also, there is a free audio tour for kids in the tram line N0.4! Download, put on the headsets and enjoy your free ride: free audio guide for kids in the tram N0.4 Link. An amazing way to have fun yourself while entertaining your kids as well is to go to a painting class at GM Schindlergut. Now, while this is not technically a free thing to do with kids in Zurich, it is super affordable. You only pay 4.- CHF for the course leaders to be able to buy materials. Let’s get creative: Kids painting class Link. At GZ Bachwiesen kids can help out on a farm and see how the animals live there while being close to them – it’s basically a petting zoo and a great way to get the little ones out in nature to get some fresh air. There is a fee of 2.- CHF, but again this is super affordable and worth it for a day of fun and a unique experience: Kids farm Link. 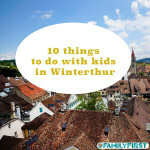 To finish off our list, this is an extra fun activity, this next idea for free things to do with kids is only free if you want it to be: a trip to one of the big toy stores in Zurich Franz Carl Weber. Even if you don’t buy anything, it’s great for your children to just wander around the huge store and gaze at all the toys around. In such a big store, staff certainly don’t mind if your little ones want to try out the occasional toy. There also are some free kids slides at the playground: Franz Carl Weber Zurich Link. Also drop by Orell Füssli over the street, the famous book store has kids book department packed with colorful books and there are also some for playing for free and it has a nice indoor playground too: Orell Füssli Zurich Link. As you can see, you don’t have to spend a fortune to have fun in one of the most expensive cities in the world – actually, you don’t have to spend anything at all to have a great day out with the whole family. We wish you a summer full of fun activities and trips with the kids!